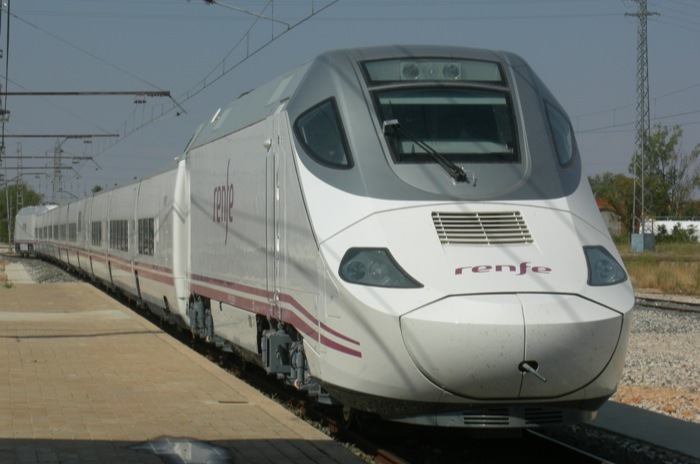 Rediff.com » Business » Get ready for Talgo's high-speed trains! The Spanish train maker has offered to test run its lighter and faster trains free of cost on the existing Indian Railways network. After successfully launching Gatiman Express, Railways is likely to hold trials of high-speed trains manufactured by Spanish firm Talgo that touch a maximum speed of 200 kmph, on existing tracks in June. Tracks were strengthened between Nizamuddin and Agra stations for the launch of Gatiman, the country's fastest train. Dispatched in a cargo ship from Barcelona on March 27, currently nine Talgo coaches are on the high seas and expected to anchor at Mumbai port on April 21. After reaching the Mumbai harbour, the Talgo coaches will get customs clearance and then moved to Izzatnagar depot for trial expected to be in June. According to a senior Railway Ministry official, "The first Talgo train trial will be conducted between Bareilly and Moradabad rail route at a maximum speed of 115 km per hour for oscillation test. This will be followed by another trial between Palwal and Mathura route at a maximum speed of 180 kmph." The third test will be carried out between Delhi and Mumbai at a maximum speed of 200 kmph. According to Railways, Talgo trains are capable of running at speeds varying between 160-200 kmph on the existing infrastructure without any upgrade. The Railways has to strengthen the tracks and upgrade the signalling system for running Gatiman Express at 160 kmph speed. Barring minor changes, there will be no need for overhauling the tracks for the Talgo trial run, he said, adding, the cost of import of coaches and custom clearances will be borne by Talgo. Besides reducing travel time, Talgo's lighter trains consume 30 per cent less energy which will help railways reduce their power bill. High speed trains: Will the railways tilt the Talgo way? Are we ready yet for the bullet trains?